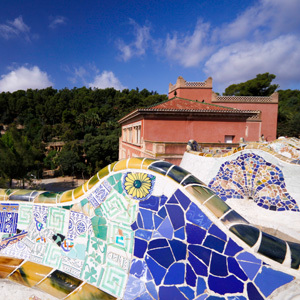 Get to know multi-faceted Spain on this exciting vacation. Start your journey in the capital city of Madrid. Visit the Aranjuez Royal Palace, marvel at the Cuenca “hanging houses,” and explore the ancient winding streets of Valencia. Drive along the Mediterranean Coast and stop at Peniscola Castle on the way to beautiful Barcelona. Travel through Catalonia, stop in Saragossa, and continue to Pamplona, known for its running of the bulls. On to Basque Country and visit San Sebastian, the port city of Bilbao, and Burgos. The heart of Spain reveals even more stunning cities, such as Segovia, Avila, and Salamanca, known for their unique historical centers and wine production. 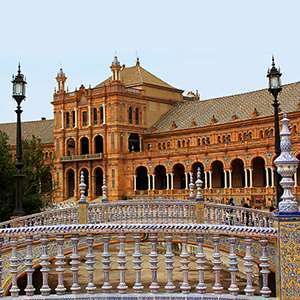 Next, head south into sunny Andalusia and discover spectacular Seville. Sample sherry wine in Montilla. Stop in the whitewashed village of Ronda; visit the exotic Alhambra complex, residence of Moorish kings, in Granada; enjoy the labyrinth of Cordoba’s old Moorish quarter surrounding the exquisite Mezquita; and retrace Don Quixote’s footsteps as you travel among the windmills and castles of La Mancha. Back in Madrid, enjoy the highlights of this elegant city. Start the day by driving to nearby Aranjuez in the Castilian Plain, where you stop to visit the ROYAL PALACE, originally built in the 14th century. 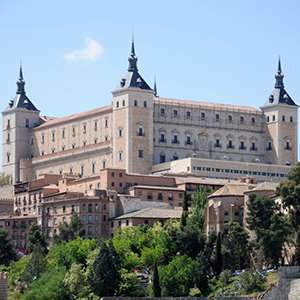 Although burned down both in 1727 and 1728, it was splendidly rebuilt and became a favorite residence of Spanish royalty. Continue traveling southeast to the magnificently located old town of Cuenca, which stands high above the precipices of the Jucar and Huecar Rivers. It is famous for its “hanging houses” that are suspended over the Huecar ravine. Journey on to Valencia and tonight, enjoy a typical dinner at a local restaurant. Valencia is known mainly for its wonderful climate and the quality of its light. Enjoy a drive along wide avenues lined with fig and palm trees and along the old quarter’s narrow streets with its fine gothic houses and typical patios. Time to do some shopping or more personal sightseeing and, of course, the option of joining an excursion. An interesting day starts with a drive north to the nearby Castellon for a visit of its PENISCOLA CASTLE, built by the Knights Templar in the 14th century. The promontory on which the castle and town are located is a fine reminder of medieval times. Continue your journey through orange groves and seaside resorts past Tarragona to Catalonia’s lively and beautiful capital, Barcelona. This morning’s sightseeing with a Local Guide will include a drive around Montjuïc to see the Olympic Stadium and a great panoramic view of the port and city. The drive continues to the city center to Plaza Catalunya and Paseo de Gracia to admire the greatness and eccentricity of Gaudi’s architectural masterpieces. See more of Catalonia as you drive northwest to Saragossa on the banks of the Ebro River. During your stop you’ll have time to see the SANCTUARY OF OUR LADY OF THE PILLAR. 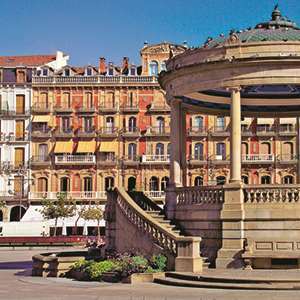 Continue north through fertile valleys and the Rioja wine-growing region to Basque Country and on to the capital of the ancient Kingdom of Navarra, Pamplona, for an overnight stay. Start the morning by driving farther into Basque Country for a visit to San Sebastian (called Donostia in Basque), the seaside resort on the southern coast of the Bay of Biscay. Journey northwest to the port town of Bilbao. Free time for leisure activities—maybe an independent visit to the Guggenheim Museum. The building, by Frank Gehry, is considered one of the 20th century’s great architectural masterpieces. In the afternoon, travel south to Burgos. Today, head southwest into Castile. Enjoy some grand scenery as you travel to the edge of the Sierra de Guadarrama, a green oasis in the Castilian desert. Stop in Segovia, magnificently perched on a rock formation at an altitude of 3,280 feet. 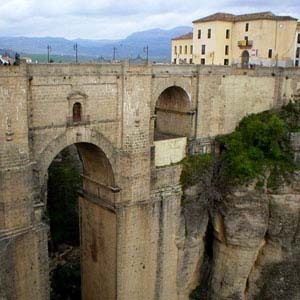 The cathedral, the Alcazar, and the Roman aqueduct are some of its more famous sights. Next, drive west to Avila for a short visit before continuing to Salamanca in time to enjoy the extraordinary beauty of its Plaza Mayor. Leave early this morning and cross the mighty Tagus River and the Guadarrama. Stop in Caceres, declared a World Heritage Site by UNESCO for its blend of Roman, Islamic, northern gothic, and Italian Renaissance styles. Enjoy more Spanish landscapes before reaching Seville, one of Spain’s most colorful cities. A full day at leisure. Perhaps you’d like to spend this morning enjoying an optional sightseeing tour including the main highlights of the vibrant city. A day to see the best of Andalusia. Head south by way of the typical white-painted villages to the town of Ronda, famous for the ravine that literally cuts it in two and, of course, its bullfighting connections. Overnight in Granada in the shadow of the mighty Sierra Nevada. Granada was the Arabs’ most treasured city; they still mourn its loss in their prayers. Visit the ALHAMBRA COMPLEX, built by Moorish kings. More grand scenery this afternoon as you travel first to Montilla for a visit to a local WINE CELLAR for a tasting. Then, continue to Cordoba on the banks of the Guadalquivir River. Cordoba is perhaps Spain’s most Moorish city with its great mosque, the MEZQUITA, one of Islam’s most important pieces of architecture outside the Arab world. You’ll also enjoy the small, white-washed houses, the winding streets, and the colorful squares. Later, journey into the very heart of La Mancha, famed for its castles and windmills. Reach Madrid in time to enjoy a relaxed evening. This morning, the optional trip to Toledo is most rewarding. The splendid setting of this old walled city above the Tagus was made famous in El Greco’s painting, and even now it’s like a great open-air museum of Spanish history and art. Later, join the included Madrid city sightseeing. Not only because it’s the capital of Spain but also because it is situated 2,180 feet above sea level, the Spaniards say it’s the nearest thing to Heaven. 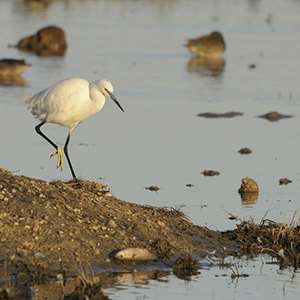 Discover Paella at The Albufera Natural Reserve The most acclaimed natural space in Valencia is the Albufera Nature Park. The marvelous lake begins on the city’s outskirts and is one of the most important ecological and environmental natural spaces in Europe. This singularly beautiful reserve is a paradise full of numerous species of birdlife. The visit conducted by an English speaking guide lasts approx. 3 hours and includes a walk through the fishing village of El Palmar, a visit of the Ethnographical Museum to see pictures of the lagoon then a boat ride with chance to see the native fauna, nesting and migrating birds. After this, rejoin the coach and move to the woods of La Devesa to learn more about the flora and to enjoy a walk on the wild beach. At the end of the visit in the Albufera Nature Park you will be taken to a restaurant in the village of El Palmar for dinner to sit down and sample typical local specialties including the famous “paella valenciana”. There is unlimited drinks (wine, soft drinks or water) plus coffee. Montserrat The history of Montserrat is fascinating and started in 880 when a small group of shepherd children saw a bright light descending from the sky in the Montserrat mountains and heard angels singing. The children told their parents, who in turn informed a local vicar who was brought to the scene and witnessed the same experiences. On exploring the region an image of the Virgin Mary was found in one of the caves and from that moment on the cave became a holy sanctuary for religious pilgrims. 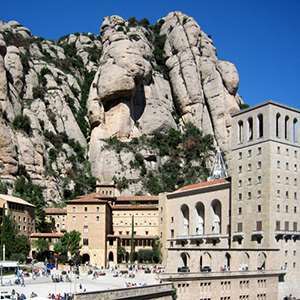 The trip to Montserrat from Barcelona is accompanied by a local guide and lasts about 4 hours. After driving through picturesque villages up to the 1,235 mt. Massif of Montserrat, you will have time to visit the Chapel of our Lady to see the visage of the 14th century Black Virgin (La Moreneta) keeping watch high over the altar. Return back to Barcelona at the end of the visit. The Basque Culture The fortified city of Pamplona is the former capital of the Kingdom of Navarra. The 16th century town walls, which enclose wide areas of the urbanization still today, are very impressing. They are, in a way, the backbone of the town and serve to the visitor as orientation for his walks through Pamplona. Alongside them one finds nice parks, wide avenues and the oldest monuments. This is the town of the “Running of the Bulls”, one of the most famous events in all the country. Great American writer Ernest Hemingway loved Pamplona for this spectacle. On the guided walking tour, you will see the outside of the Bull Ring, Running of the Bulls Streets, Cathedral, Town Hall and road to Santiago. There will be a stop in one of the beautiful cafeterias in the heart of the town for a glass of wine – perhaps one of the cafes where Hemingway liked to sit when he was in Pamplona. Then proceed to a traditional local restaurant for a tapas dinner including 3 cold tapas, 4 hot tapas, dessert, Navarra wine and coffee. City Sightseeing Andalusia’s capital, Seville, is internationally renowned and has been completely renovated in recent years. It has an impressive monumental heritage, a rich and varied festive calendar and a disarming and unforgettable character, the result of a long history which has frequently marked Spain’s destinies. The guided sightseeing tour lasts approx. 3 hours and includes first a drive to see Torre del Oro, riverside, Maria Luisa Park, Plaza de Espana and the old Tobacco factory. Continue the sightseeing on foot through the Santa Cruz Quarter (the old Jewish section) to the Cathedral, which is one of the most complete Christian temples in existence, for an inside visit. Then its back to the coach to return to the hotel via the Bullring, EXPO ’92 site and Macarena City Walls. It could happen that the Cathedral is closed to the public and in this case a visit will be made to Casa de Pilatos (Pilate’s House) which is an Andalusian palace in Seville and serves as the permanent residence of the Dukes of Medinaceli. Classic Flamenco Show One cannot leave Spain without having heard the clicking of castanets!! 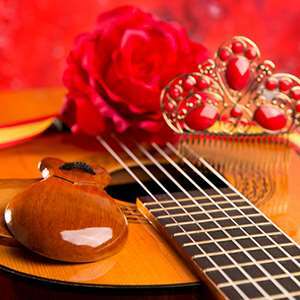 You will be taken to a flamenco venue founded in 1952 which hosts many famous flamenco performers and is known for performances which feature a variety of flamenco styles as well as classical Spanish dance and music. The evening lasts about 1 and a half hours and during the evening one drink is included at your choice. Sevillian Evening Out The place we have chosen for dinner is an authentic Andalusian palace built in the 1920’s, where on warm evenings one can dine in the lovely walled courtyard with scented climbing plants, candles and water features. For dinner the chef will delight you first with an aperitif of sherry wine with Andalusian olives, followed by a regional menu with a choice of first and second course plus dessert. 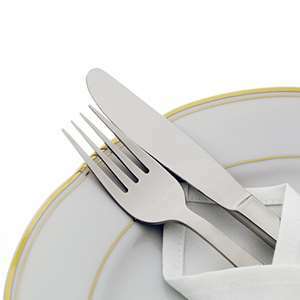 Drinks included with the dinner are 1 bottle of wine for every 2 persons or soft drinks plus mineral water and coffee or tea. Madrid By Night & Tapas An authentic Spanish food experience in a local restaurant tucked away in the center of old Madrid. The venue with its warm ambiance is home to solid Castillian cuisine and the tapas dinner we are offering you gives a sample of a variety of dishes i.e. “tortilla espanola”, “jamon serrano”. Included is the well-known Spanish drink “sangria” or soft drink or mineral water. 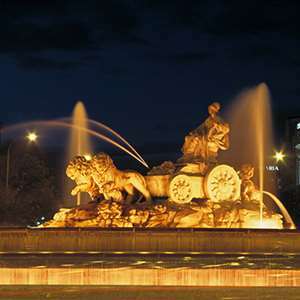 After dinner, see some of the main sights of Madrid on a short orientation drive before returning to the hotel. The Majestic City of Toledo Toledo is one of the Spanish cities with the greatest wealth of monuments. Known as the “city of three cultures” because Christians, Arabs and Jews lived together there for centuries. Behind its walls Toledo preserves an artistic and cultural legacy in the form of churches, palaces, fortresses, mosques and synagogues. This great diversity of artistic styles makes the old quarter of the capital of La Mancha a real open-air museum, which has led it to being declared a World Heritage site. Upon arrival in Toledo there will first be a drive around the city with a stop for a panoramic view. Then a walk in the city visiting one of the most outstanding buildings in Toledo – the Cathedral – considered one of the high points of Gothic art. Continue with a visit of the church of Santo Tomè, which is famous for housing El Greco’s famous picture entitled “The burial of Count Orgaz”.